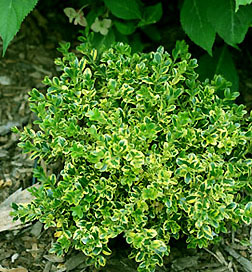 The Wedding Ring Boxwood Shrub is one of the more interesting small growing evergreen shrubs for bordering small gardens or defining landscaped areas. The glossy green leaves with lime edging maturing to gold over summer give the miniature Wedding Ring Boxwood multi season interest. The Boxwood Wedding Ring holds its color well in any landscape setting. Wedding Ring Buxus microphylla var. koreana Boxwood is virtually maintenance free, yet can be lightly pruned for shape in summer.